How are you doing? Hope all is well with you and the crew. Every time I take the E-Type to a show, people ask "what is that color?" . . . "is that an authentic Jaguar color" . . . "who painted it?". Please tell Thurman his work still shines- and is always admired by a lot of people! I have only been to two shows so far this year, but the car has a "double-double" going - 2 awards each time. 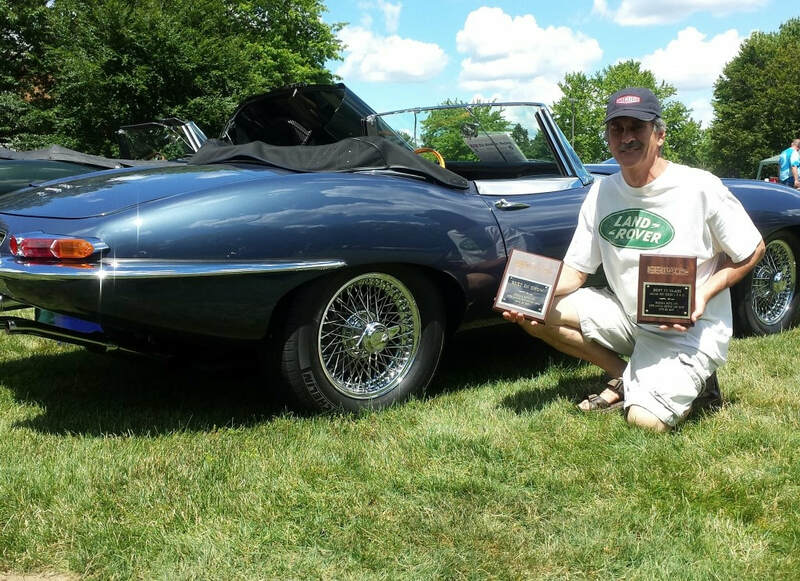 Park Concours in Cincinnati (June 11)- Best in Class, Best Jaguar. I wanted to thank you so very much for helping me with the correct installation of my door chrome on my 1962 Jaguar XKE Roadster. Not only did you provide me with all I needed for my new interior, but your follow up service has been great! I purchased my top and my top cover from you as well, and my car looks like new! 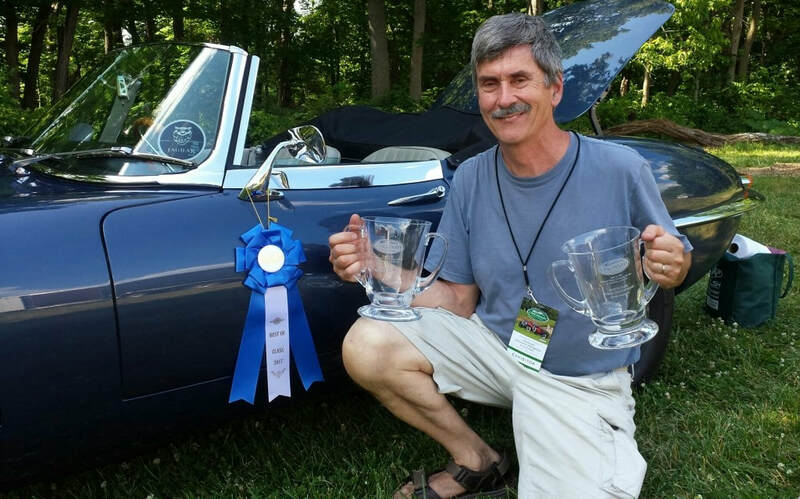 Many people ask me who made the top and interior and they are all impressed that I use the best, original Jaguar Interior manufacturer and installer in the USA, OSJI. When I found out that my Jaguar had the rear bulkhead that was straight instead of round (early Jaguars were always a work in process), you exchanged my round bulkhead cover for a straight one immediately. When I found out that I needed to buy an aftermarket radio blank, that was required to be covered in leather matching the seats, you sent me the small piece of leather required. When my local auto interior company had trouble installing the clips I bought from a major Jaguar parts house, I contacted you and you had your installation department discuss this with me, and then they sent me the correct clips, which allowed the chrome to be easily installed. Thank you so very much for being the best interior manufacturer for Jaguars in the world! A belated Happy New Year to the entire crew at M.I.C! I just wanted to thank you for the beautiful 2019 calendar. I was thrilled to death to see my ’64 OTS as the May Play-Mate! Then I noticed that the interior displayed in October looked mighty familiar…a double honor! Meanwhile the Jag continues to run and look like new and is usually the most popular car at the local Cars n’ Coffee. "Outstanding service! -- Customer always come first. Top shelf technicians that can repair anything." Can't say enough about Brandon Drummer and work he did on our 2000 Porsche Boxster S. Car was just beautiful when finished and everything worked as it should. Ditto for General Manager Chuck Crabtree, Service Writer Jerry Norton and entire staff. What a collection of fine craftsmen and women! You are in good hands at Muncie Imports & Classics no matter what type of vehicle you bring in or what you have done. 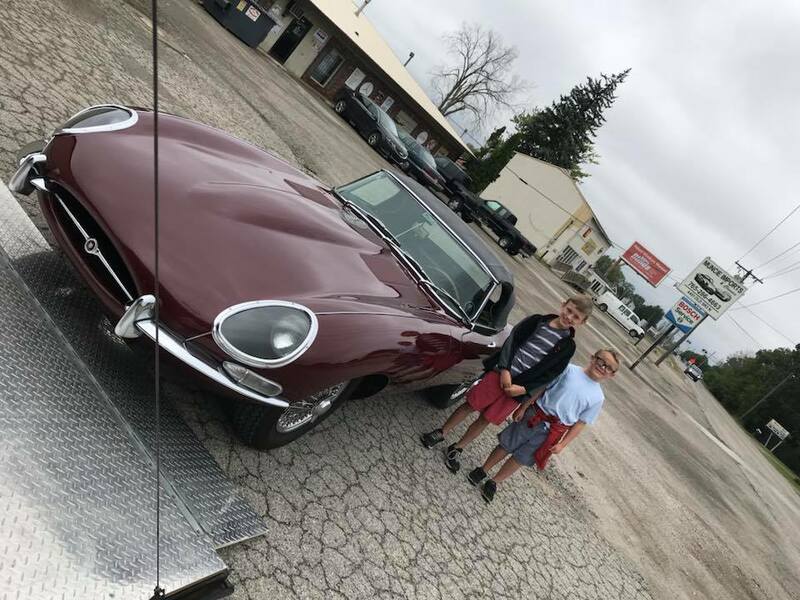 Tom and Chuck have always taken great care of our 1967 E-Type and I would highly recommend them to anyone with a classic or present day Jaguar.